NEW YORK—After months of revelations by the Associated Press of spying by the New York Police Department (NYPD) on the Muslim community here and throughout the Northeast, the AP recently exposed surveillance by the N.Y. cops on racial justice, antiwar, labor, anti-repression and other movements as far afield as New Orleans. The revelations have broadened a coalition initiated in response to the spying on Muslims, which quickly linked up with Black groups fighting the NYPD’s “stop and frisk” and other repressive policies, and Occupy Wall Street activists battling police repression. At a March 28 press conference, representatives of all the groups mentioned in the leaked NYPD memo participated, including DRUM-Desis Rising Up & Moving, the Malcolm X Grassroots Movement, War Resisters League, International Action Center, Al Awda NY, Ruckus Society, Mosque of Islamic Brotherhood Justice Committee, Peoples’ Justice for Community Control and Police Accountability, Committee Against Anti-Asian Violence, Domestic Workers United, May 1st Coalition, and Critical Resistance. Endorsers included the National Lawyers Guild NYC Muslim Defense Project, the Majlis ash-Shura (Islamic Leadership Council) of Metropolitan New York, Council on American Islamic Relations-NY, South Asian Solidarity Initiative, Brooklyn For Peace, Muslim Consultative Network, Raha: Iranian Feminist Collective, Occupy Wall Street and the OWS Immigrant Worker Justice Working Group, New York Committee to Stop FBI Repression, Where Is My Vote-NY, and the United National Antiwar Coalition (UNAC). Fahd Ahmed, Legal and Policy Director of DRUM-Desis Rising Up & Moving, told the press that the NYPD, which had already been exposed as spying on every Muslim mosque, community and student organization, and business in New York City and in many other states, had now been revealed as having spied on a wide variety of movements simply for being engaged in political activities. The police, of course, claimed the spying was needed to stop “terrorism,” yet the leaked memo reports nothing other than rallies, e-mails with endorsements, and routine speeches of peaceful political groups. The document reveals that in 2008 an undercover NYPD officer traveled to New Orleans to attend the People’s Summit, a gathering of progressive groups opposed to pro-corporate trade agreements between the U.S., Canada, and Mexico as well as to racist immigration policies, pro-business labor laws, and racial profiling. Among the individuals singled out were New Orleans activist Jordan Flaherty, well known for his writing and work around Hurricane Katrina and Palestine solidarity, and Marisa Franco, a labor organizer for Domestic Workers United (a group whose thousands of mostly Black and Latin@ members recently won a landmark victory recognizing their rights on the job from the New York State government). The NYPD memo also goes into great detail about spying on those active in protests against the racist murder by cops in 2006 of an unarmed Black man, Sean Bell. Ironically, the very same week as the coalition’s press conference, two detectives involved in the shooting were forced to retire—an admission, despite the NYPD spying, that the activists’ accusations were correct. Just two weeks before, a court hearing in Manhattan highlighted another insidious aspect of NYPD spying. In their opening arguments in the case of Ahmed Ferhani—an immigrant from Algeria who is charged with working to commit a violent act against a synagogue—defense lawyers showed how the police informant who entrapped him had spent years in surveillance and infiltration of the Palestine solidarity movement. And when the informant’s handlers grew desperate for results to justify his and their expenditures, they latched onto Ferhani, a young man who has been repeatedly institutionalized for mental illness. As in other recent entrapment cases—many of which also center on individuals of questionable mental health—Ferhani’s alleged crimes are nothing more than supposed verbal responses to a fictional plot dreamed up by the informant. The weekend after the press conference, these revelations were highlighted at the national conference of the United National Antiwar Coalition, from the welcoming remarks Friday night on through plenary sessions and workshops against repression. Attendees discussed ways to continue building solidarity with the communities and movements under attack, and passed a resolution initiated by the Muslim Peace Council for a June 16 rally in New York. 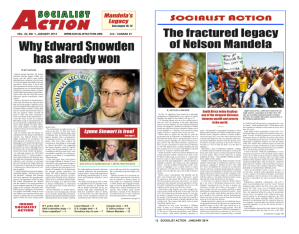 > The article above was written by Andrew Pollack, and first appeared in the April 2012 print edition of Socialist Action newspaper.